It was December 1st a day ago, and now it’s almost a week until Christmas. Crazy how time goes by so quickly. I actually bought and ordered our christmas cards at the end of November and thought I was on top of things. However, somehow they were only sent out this week. I probably should have sent them out at the beginning of December like I thought I was going to do. Oops. I am on top of my christmas shopping though. Last night I think I actually managed to finish all of my shopping. There’s a few things I bought online this year and I am hoping they make it in time for the big day. One of them is actually at the post office right now waiting to be picked up, but when I went the other day there was a line up out the door to pick up packages. I think I’ll try again today and hopefully it won’t be so crazy. Maybe. Now it’s time to wrap all of the gifts. Our family had lots of traditions growing up, including opening all of our gifts on Christmas Eve because that’s the European tradition. Italians have a big Christmas Eve, and Christmas day isn’t traditional as it is in Canada. I never woke up on Christmas morning to a stocking, or the excitement that Santa had come. I had all my gifts Christmas eve, usually falling asleep on the couch waiting for ‘Santa’ to visit my Nonna’s house (usually my Nonno or my Zio dressed as Santa) after our massive Feast of Seven Fishes dinner. Which was fine by me because that meant I got to wake up on Christmas morning and immediately play with my toys. Some years my brother Nick or I would stay at my Nonna’s and sleepover there instead on Christmas eve, waking up with my Nonna and Nonno on Christmas morning. Christmas day we spent with my moms side of the family, with a big dinner surrounded by aunts uncles and all of our cousins (my mom is the youngest girl of 6 children, so we have a lot of cousins). However, since we never did the whole Christmas morning thing, we never had a big Christmas day breakfast or brunch like a lot of families do. Usually it would be coffee for my parents and Panettone for Nick and I. 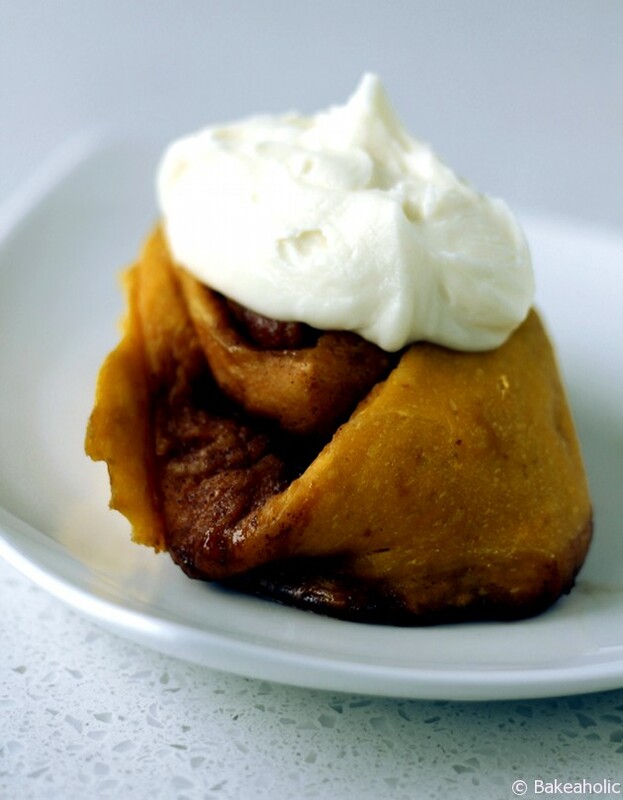 These Pumpkin Cinnamon Rolls would be a great addition to Christmas morning when you’re feeding a crowd, and you could even make them the night before just allow them to rise and then leave them in the fridge until morning. Take them out about 30 minutes prior to baking. I used coconut sugar instead of brown sugar, so they aren’t overly sweet since they are usually smothered in a sweet cream cheese icing. I found the original recipe here, and subbed in Almond Milk for regular milk, reduced some of the sugar and made it with half gluten/wheat free flour as well. In the bowl of a stand mixer, combine warm almond milk and 1 tsp granulated sugar. Sprinkle with yeast and let stand 10 minutes, until frothy. Next whisk melted butter, remaining 1/4 cup sugar, eggs and pumpkin puree together in a medium bowl. Use paddle attachment to beat 3 cups of the flour into the frothy yeast, then add in the pumpkin mixture. Switch to dough hook attachment. On the lowest mixer speed, add remaining 3 cups of flour one cup at a time until the dough forms a smooth ball, about 5 minutes. Transfer dough to an oiled bowl ( I like to spray mine with coconut oil), turning dough to coat completely with oil. Cover with plastic wrap and let rise in a warm place until doubled in volume, about 1 ½ hours. 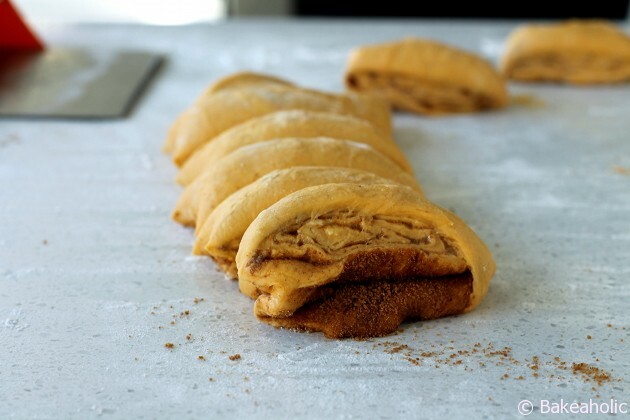 Turn dough onto a floured surface and roll it out into a rectangle about ⅛” thick. For filling, spread softened butter over the surface of the dough using your hands to cover evenly. Combine brown sugar and spices in a small bowl, and sprinkle over the butter. 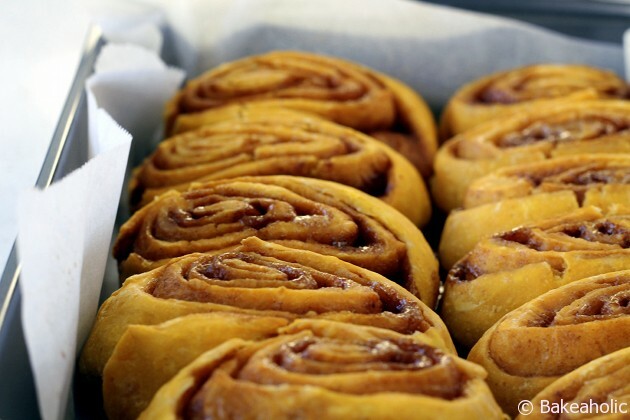 Starting with the edge closest to you, gently roll the dough into a long log. Using a dough scraper, or sharp knife cut into about 15-17 pieces. Arrange in a 9×13” baking dish, and one other small baking dish. Cover with a clean towel and allow it to rise somewhere warm until doubled in volume once more, another 60 minutes. Once ready, bake at 350 F for 20-25 minutes. In a medium sized bowl using a hand mixer, combine cream cheese and butter. Continue to mix until fluffy and whipped. Add confectioners’ sugar. Beat until well combined. You can spread onto warm rolls, if you want it to melt a little. 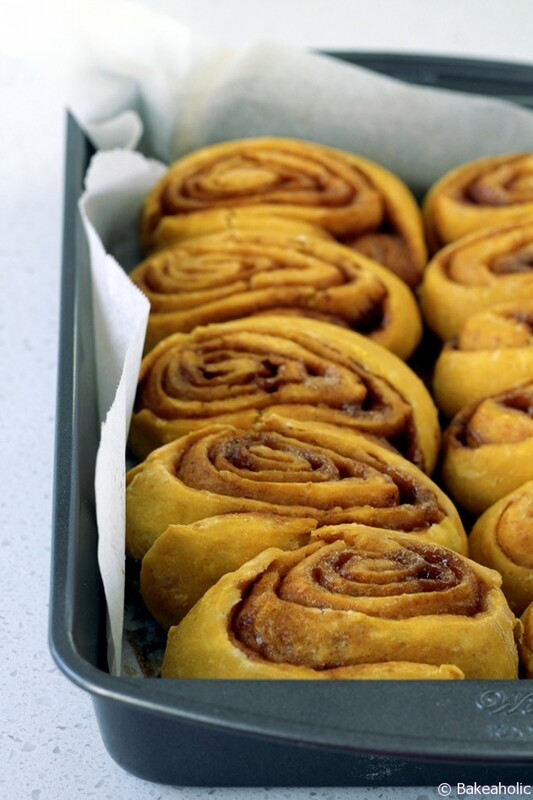 Otherwise allow the buns to cool and then spread on for a thicker icing.